With mounting pressure for industries to reduce their carbon emissions, hydrogen is a ‘hot topic’ in both the motor vehicle manufacturing and renewable energy sectors. For Tshwane-based specialised engineering company RTS Africa Engineering, hydrogen-based technologies have exciting implications for a more energy-efficient future. The company is the sole agency for leading global hydrogen technology company NEL Hydrogen in sub-Saharan Africa. “Hydrogen is potentially the energy carrier of the future: by transforming electricity to hydrogen through water electrolysis, energy can be stored for later use. It is also considered one of the important fuels of the future as it provides clean and emission-free fuel for transport,” says Ian Fraser, Managing Director of RTS Africa Engineering. NEL Hydrogen, a Norwegian company, has been at the forefront of hydrogen production through water electrolysis (the process of splitting water into hydrogen and oxygen using an electrical current) since 1927. The company produces electrolysers for large-scale hydrogen production; as well as for hydrogen storage of renewable energy and has installed more than 500 electrolyser units around the world. In Africa, these include installations in Kenya, Egypt, Algeria and Nigeria. Locally in South Africa, these include installations in Saldanha Bay and Sezela in KwaZulu-Natal (KZN). These units are extremely robust and reliable, requiring almost no maintenance, according to Eric Dabe, Sales Director at NEL Hydrogen. “Our hydrogen production plants have an extremely long life-cycle, 40 years or more. 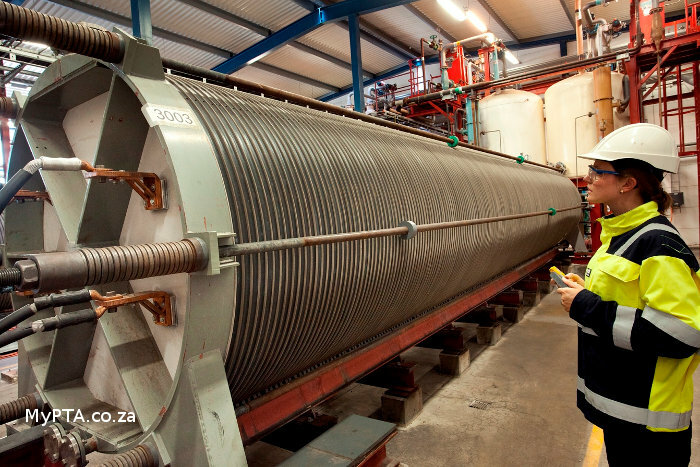 A case in point is the electrolyser that we installed for a leading sugar producer back in 1983, which runs for 24 hours a day and is still fully operational,” says Dabe. RTS Africa Engineering, featuring considerable in-house technical skills, was the first of NEL Hydrogen’s representatives to become a service agent. “Service at a distance – in this case Norway – can be a challenge. I am pleased that NEL Hydrogen has entrusted us with local service and support. Our customers expect a 24 hour service and we have been able to fulfil that requirement,” says Fraser. NEL Hydrogen, based in Notodden, Norway, started life as part of Norsk Hydro, using electrolyser technology for large-scale hydrogen production for the company’s ammonia fertilizer plants. In the 1970s, the company started selling its technology further afield, and became part of Norway’s oil and gas giant Statoil in 2007. In 2014, a group of Norwegian investors bought NEL Hydrogen, foreseeing massive potential for growth in the demand for hydrogen as an alternative fuel and as energy storage. A new listed company was formed, NEL ASA, which is a driving force in hydrogen-based technologies worldwide. With the acquisition of the Danish company H2 Logic in 2015, NEL ASA plans to further develop the hydrogen refuelling station (HRS) infrastructure in Norway and further afield. The company has also bought the rights to ‘Rotolyser’ technology (rotating electrolysers) which offers greatly enhanced efficiencies and footprint reduction. This technology, described by Dabe as “revolutionary” is still in its research and development stage. “NEL Hydrogen has entered into a very exciting phase with two main drivers: hydrogen production through global electrolyser plant installation; and a new focus on hydrogen refuelling stations through our acquisition of H2 Logic. We are committed to a future hydrogen society – which includes using hydrogen as a storage medium in integrated, renewable energy systems – and providing the technology to make this possible,” says Dabe. There are numerous industries which depend on on-site hydrogen generation: from metallurgy, chemistry and electronics to power generation and float glass. Hydrogen plants, based on water electrolysis technology, have particular application in areas where there is no access to either natural gas or pipeline hydrogen. Since 2011, NEL Hydrogen has supplied over 50 megawatts (MW) of hydrogen plants worldwide (or approximately 12 000 Nm3/hour). NEL Hydrogen has developed three standard models, which are modular in design and can be scaled up. Known as the NEL A electrolysers range, this includes the NEL A-150 (providing between 50 and 150 Nm3/hour), the NEL A-300 (151-300 Nm3/hour) and the NEL A-485 (301-485 Nm3/hour). “The NEL A electrolysers offer complete reliability and flexibility for the end-user, and are a highly cost-effective solution to hydrogen generation. The fact that there is no need for maintenance shutdown adds to the low-cost benefits,” says Fraser. When it comes to hydrogen refuelling stations, Dabe notes that Japan, Germany, UK,Scandinavia and USA (California) are currently at the forefront of infrastructural development. Iceland was however the site of the world’s first public hydrogen re-fuelling station in 2003 – another of NEL Hydrogen’s pioneering achievements – and Norway lead the way with the first hydrogen road, connecting the west coast to Oslo in the south. He also notes that hydrogen technology is a fast developing market in central and West Africa. For Fraser, with major motor vehicle manufacturers making headway with hydrogen vehicles, the time is right for the development of a hydrogen infrastructure in line with countries such as Japan, Germany, UK, Scandinavia and USA. “With the ramping up of production of hydrogen cars, such as Toyota’s Mirai, the hydrogen economy, globally and locally, is starting to come into its own. Hydrogen re-fuelling stations are starting to enter the commercialisation phase and we, at RTS Africa, see exciting possibilities for the future in South Africa: such as in the bus and taxi industries, with the utilisation of a single refuelling base along a busy commuter route,” he says. NEL Hydrogen has been active in South Africa for a number of years, re-entering the country post-sanctions in 1996. It has established a long-term relationship with RTS Africa Engineering as its partner in servicing and overhauling electrolysers not only in this country, but further afield, including installations in France and Algeria. “With the backing of many decades of continuous improvement in electrolyser technology for the production of hydrogen, at a minimum life-cycle cost, we can offer our customers in Africa expert advice, service and support through our local partner, RTS Africa,” Dabe concludes.